Childcare and spanish translation will be provided. Foodl will be served as well. 800 people converged at UC Berkeley to discuss, debate and voted on March 4th as the Statewide Strike and Day of Action. On March 4th hundreds of demonstrations, occupations, walk-outs and job actions happened in California and in 32 other states. We come together on April 24th to plan our next step. 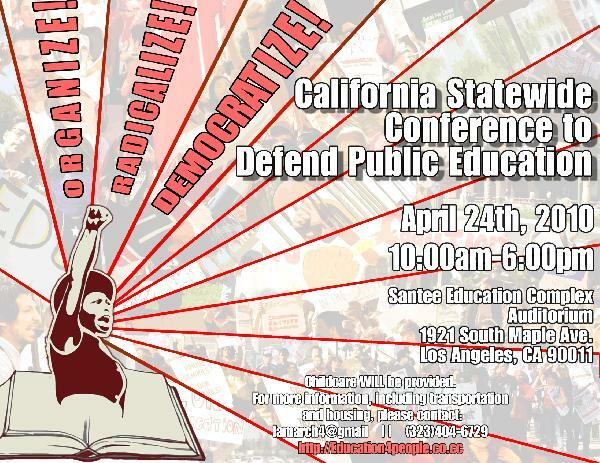 Anyone who attends will have a voice and a vote in how we will continue the fight for public education. All who wish to defend public education are welcome! Discussion topics: March 4th before, now and the future of hte movement, how to make the movement more permanent, future actions, demands and name of the movement. K-12, Community College, Cal States, UC's are all welcome, all equal.